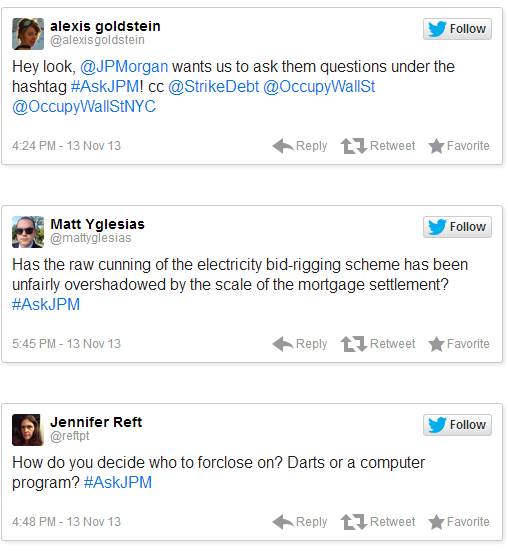 After the silly plan, JPMorgan’s social media desk gave a tweet that there will be open question and answer session with the company’s Vice Chairman, Jimmy Lee who will be available to answer questions of any kind, for one hour. The gush of offensive tweets from the people were completely surprising for the vice president. The tweets were in-surging from all around the country and taking the corporate giant by storms. People were completely rolling out their frustrations and yowls on the economic crunch and tough times they are suffering or have suffered in the recent past. Some asked ”Do you love kicking us from our homes Mr Lee?”. Some people just chocked out Lee and started trolling the Wall Street. Here are some of the glimpse of the show that happened at Twitter. After giving it a spin for more than three days and facing the worst PR-devastating experience, JPMorgan rolled back its so called ”Twitter Takeover”. 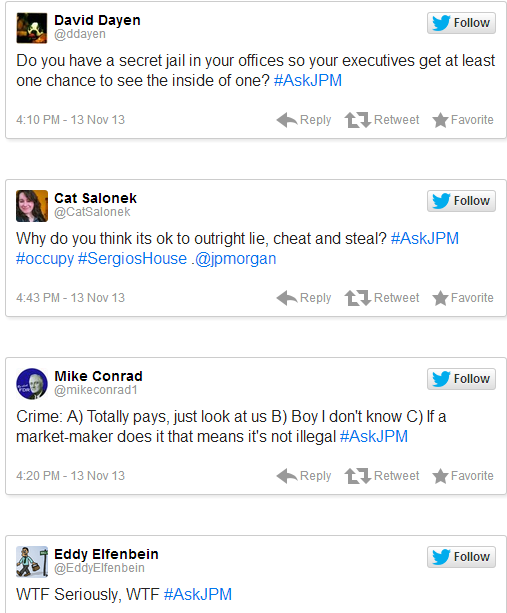 The spoliation of Twitter campaign which started with an intention of meshing a forced hashtag saying #AskJPM was completely bashed because of wrong strategy, poor handling and non-serious attitude from a mainstream company. Lets hope big guns learn from this and lets hope Wall Street do something about the ugly bills.